Well, big news!! Harvey Nichols is coming to a mall near YOU! Harvey Nichols have announced the opening of its first store in Kuwait, with the help of the Middle East franchise operator Alshaya…thank you, Mr. AlShaya. The store, which will be situated in Kuwait’s largest shopping destination, will cover over 10,000-square metres of retail space and will stock Harvey Nichols’ most popular brands and designer names. 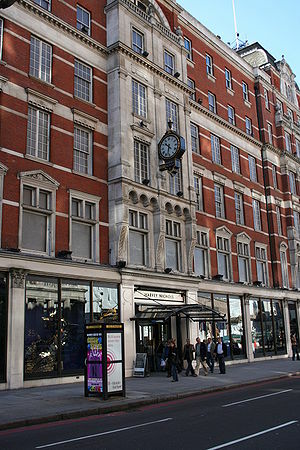 The store will also house the signature Fifth Floor Restaurant concept, which was originally created for the Knightsbridge flagship but is now synonymous with the Harvey Nichols name. “Our own research and experience points to a strong market for the brands offered by Harvey Nichols,” Mohammed Alshaya, executive chairman of MH Alshaya Co, said as the partnership was announced. Harvey Nichols, too, is hopeful that the union will be highly prosperous. Joseph Wan, the company’s chief executive, is “confident that Harvey Nichols will experience lasting success with Alshaya”. The store is set to open its doors in spring/summer 2011. Rafi’s new lover is–unfortunately for Lisa–her only son, David. Both David and Rafi must contend with their 14-year age gap, vastly different backgrounds and the demands of David’s traditional mother- just watch the moment when the mother finds out who her client is dating…..and sleeping with…….hilarious! A must see for all on a Thursday night in! d in Sunday’s Premier League curtain-raiser against Liverpool. Many Gooners have been too overjoyed at the player’s public statement of commitment last Friday to question whether his heart is really still in north London but so angered have Arsenal been by the conduct of Barcelona and the player himself over the last three months, they will accept having a disaffected skipper on their hands. Looks like Barca will get their man but on Arsenal’s terms…..